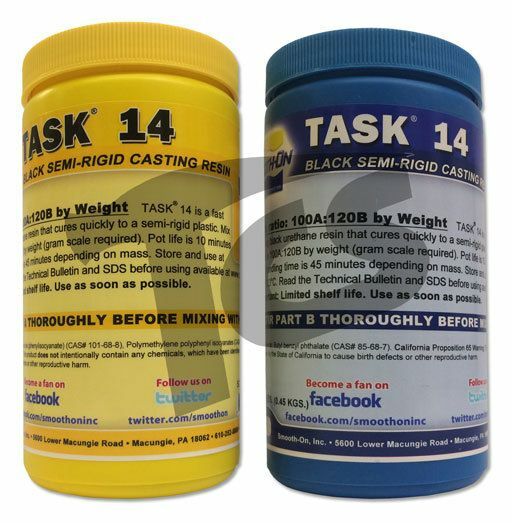 PRODUCT OVERVIEWTASK® 13 and TASK® 14 are fast setting two-component urethanes that cure quickly to black semi-rigid plastics.TASK® 13 has a pot life of 3 minutes and demold time of 20 minutes. 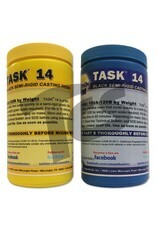 TASK® 14 offers a longer pot life (10 minutes) and demold time of 45 minutes. With a Shore value of 50D, these semi-rigid plastics are used for a variety of industrial applications including fast mold making, fast model duplication, prototyping, durable miniatures, black props and special effects, or making parts that are impact resistant. Fully cured castings are tough, durable and chemical resistant.